Dhoot Industrial Finance Ltd. is in portfolio of Subramanian P. He is one of the top investors in India. It is a Conglomerate dealing primarily with Metals and Wind power. The name is confusing and it is easy to assume that Company belongs to Financial sector. It has four Wind Mill located. Three Wind Mill are located in Satara and one in Sangli. There is not much details mentioned about other products. The company was trading at 1 INR in year 2002. In next 6 years time it gave more than 40 times return. Investors made fortune in this company during that time frame. The momentum got hindered due to 2008 global crisis and prices were crushed below 10 mark. Until year 2014 Company was struggling to make any progress. You can view this period as consolidation period. 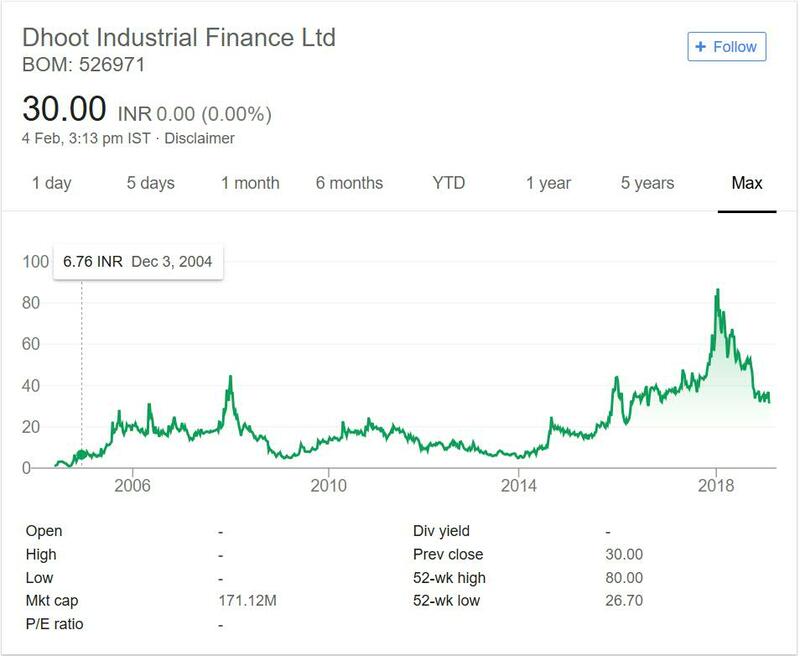 During recent bull run from year 2014 to 2017 the Company moved past 80. The website of Company does not provide detailed information about business but it has performed well of exchanges. Investors have made 30 times money in this counter in last 16 years if you consider today’s price with that of 2002. Dhoot Industrial Finance Limited is a Conglomerate. It seems that Wind Mills are major focus area of the Company with four plants. The plants are concentrated in Satara district. Other operations are creation of various compounds and gases. The lack of information on website makes things difficult to understand. I was not convinced with business of the Company.It is not operating in one direction or focus area. Some of the products are Chemical compound (making it Chemical Company), Some of them are Metal compounds making it Mining and Metal company and Wind Mill as mentioned above is focus area. Company has given stellar returns in past 16 years or so. But it would be tough to grow further without clear direction. I do not like companies without any clear vision or direction of business.